The alien agents go back in time for Men in Black 3. In the 2012 movie, the fate of the planet is at stake, of course, as well as the life of Tommy Lee Jones’ (Captain America: The First Avenger) Agent K. To save them both, Will Smith’s (I Am Legend) Agent J goes back in time to put things right. In the past, he partners with the younger version of Agent K (Josh Brolin, True Grit) and discovers secrets to the universe that Agent K didn’t tell him. Directed by Barry Sonnenfeld, like the first two movies, Men in Black III also stars Emma Thompson (Nanny McPhee), Jemaine Clement (Dinner for Schmucks) and Michael Stuhlberg (TV’s Boardwalk Empire). Rated PG-13, the science-fiction film grossed a tidy $179 million in theaters in the U.S., good but less than the original’s $250 million and Men in Black 2‘s $190 million. The third installment got mixed reviews, with critics generally agreeing that although the movie’s fun, it’s not as good as the original. Well, naturally. All three disc versions include a downloadable and streamable version of the movie via UltraViolet and special features. A Men in Black Trilogy Limited Edition Blu-ray Giftset is also available with all three films on Blu-ray with UltraViolet in collectible packaging and a “Worm” bobble head figurine. The set is available only for a limited time and at select retailers, so get it quickly if you’re interested. 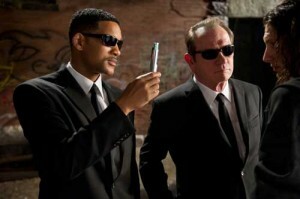 Men in Black II made its Blu-ray debut in May 2012.